This is a good time to be a mortal. Life expectancy today is roughly eighty years for anyone in the world's developed countries. And life expectancy is still improving, which is why each day we live now we are given the gift of more time down the road. It's as if we're all driving on a highway that is still being built, and the roadbuilders are adding to it at a good rate. Our bodies haven't changed. We haven't evolved. A few generations is too brief a time for our life spans to have gained thirty years through evolution. It's only that our circumstances have gotten more comfortable. A field mouse in the wild lives about one year. The same mouse in the safety of a cage lives about three years. With our farms and supermarkets and reservoirs and thermostats, we have done for ourselves what we have done for a pet mouse. We have tripled the life expectancy that our ancestors enjoyed or suffered in the wild. The study of longevity is now in an almost feverish state. Twenty years ago, not many biologists worked on the problem. The field was small. It seemed old. You might say the science of eternal youth was looking and feeling its age. Efforts to extend the human life span in any serious, deliberate way had gotten nowhere since the studies of the ancient Greeks and Babylonians; since the tomb-builders and tomb-robbers of Egypt; since the glory days of the Taoist deep breathers, extreme dieters, and sexual athletes of China ("He who is able to have coitus several tens of times in a single day and night without allowing his essence to escape will be cured of all maladies ..."). But today the science of longevity is growing fast. Once more it is turbulent, and painfully confused. It feels young again. The faces of the biologists who argue at international meetings about where we are, where we are going, and what we can or should do when we arrive, really are getting younger, because many new people are joining the field. Specialists in this field call themselves gerontologists. The word comes from the Greek root geron, which means old man, but that suggests a focus that is misleadingly narrow. While it's true that the problems that limit our life span are normally most visible and cruel when we are old, gerontologists care about much more than the last years of life. They want to understand the whole span. Pediatricians treat the young. Geriatricians treat the old. Gerontologists try to understand why our bodies change from youth to age, why we age at all -- why we are mortal. The problem of longevity is a deep problem because to understand it well enough to do anything fundamental about it, you first have to answer the questions: What makes us mortal? Why do we die? Why do we get frail year by year and ever more likely to die? When does the decline start -- at forty? At thirty? When sperm meets egg? And where does it start -- in the cells that compose the fabric of our tissues? In the way the organs talk, or fail to talk, to each other? What is aging? This is one of the hardest problems in biology. It is even harder than explaining consciousness. No one has managed to explain consciousness yet, either, but for some time we've had the source narrowed to a zone above the neck. As gerontologists do begin to locate and explore the sources of mortality, many of them feel an incredible excitement. It's true, of course, that every mortal reaches the end of the road eventually -- somewhere around the age of one hundred twenty, even supercentenarians seem to come up against a wall, and most gerontologists accept that wall as our limit. But they have hopes that they can help more of us reach it, and alleviate some of the suffering of old age along the way. As we approach some kind of limit now, it seems likely to most gerontologists that to go much further with either our average life expectancy or our maximum life span we would require a breakthrough in their science, in their understanding of the wellsprings of mortality. Only if they can figure out what aging is and what to do to change its rate will human life span take another big jump. Most gerontologists do not expect to see that breakthrough in their lifetimes. One group of conservative, well-respected gerontologists has proposed that our goal should be to add another seven good years to the human span. A few of the most enthusiastic people in the field have begun to argue for much more. If they are right, then our descendants in another few generations may expect to live as long as Moses, who is said to have lived 120 years; Noah, who lived 950 years; or Methuselah, the oldest man in the Bible: "And all the days of Methuselah were nine hundred sixty and nine years: and he died." Aubrey de Grey thinks there is no limit. He is convinced that we can double or triple our life span again and again, and so onward and upward. We can engineer as long a life span as we like, "even life for evermore" (Psalm 133). That's hardly the majority view in gerontology. On the other hand, the field is so splintered and spiky right now that it's hard to find a majority view. Gerontologists can't agree on a way to measure aging, or what they mean by aging. Because so much of the action takes place in the United Kingdom and the United States, they can't even agree on how to spell the problem under discussion: aging or ageing. They fight over definitions of longevity, health, life expectancy, life span, maximum life span. But even in this overheated moment, Aubrey is the most fervent of them all. 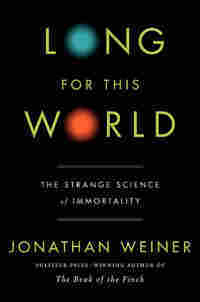 Excerpted from Long for This World: The Strange Science of Immortality by Jonathan Weiner. Copyright 2010 by Jonathan Weiner. Excerpted by permission of Ecco.